The ARM-2 circuit detects when the locomotive enters the loop and switches the output polarity almost instantaneously. This is achieved by using solid state switching so the delay to reverse the polarity is only a few milli seconds. If after the output polarity has been switched and a short circuit condition still exists, the DCC circuit breaker feature kicks in and disconnects the output. The output will remain disconnected for 15 seconds if the unit is in automatic mode or will remain disconnected until a reset button is pressed if the unit is in manual mode. * Solid state design for fast switching. * DCC Circuit breaker mode for block protection. * Auto or manual reset of circuit breaker function. 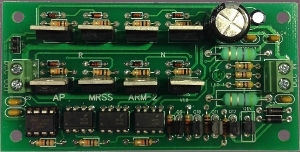 Connections to the ARM-2 board are simple and easy to understand. 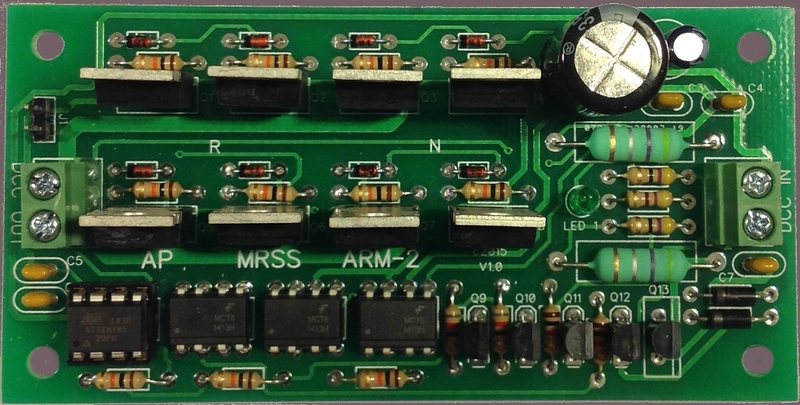 This ARM-2 board requires no external power source.